Trans States pilots can now flow to the Denver-based Airbus operator after as little as two years of service with Trans States. In fact, Trans States’ family-oriented culture is part of what makes its flow program with Frontier Airlines a natural fit. The Denver-based Airbus operator takes great pride in making new pilots feel at home on day one. 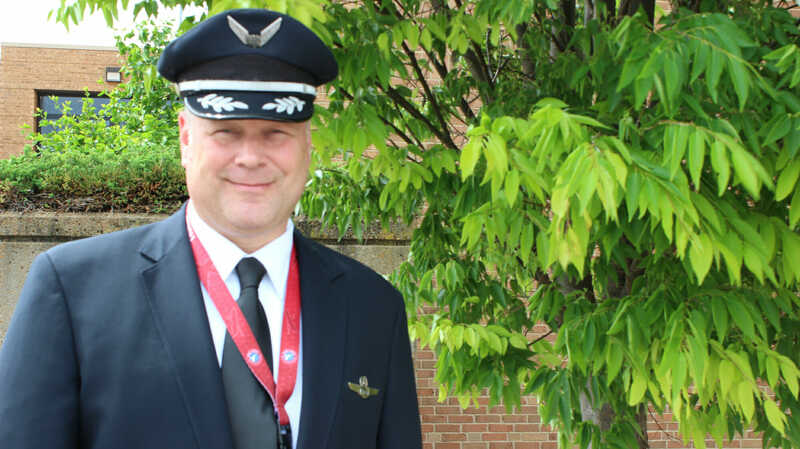 “Even when I was a new hire, it was incredibly impressive how much our airline cares about you as a person,” recalls Frontier First Officer and Instructor, Chris Dillon. The flow program between Trans States and Frontier isn’t a guaranteed interview—it’s a true flow. 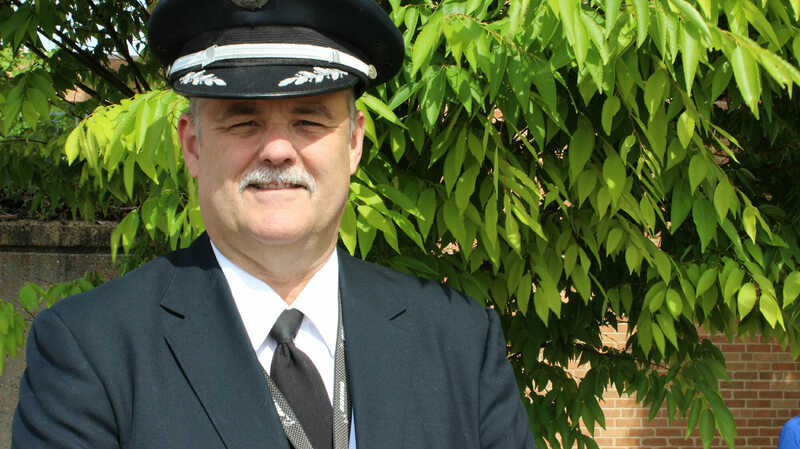 Trans States pilots who opt-in to the program are guaranteed a First Officer position at Frontier after as little as two years so long as pilots maintain predetermined qualifications in training, reliability and discipline. 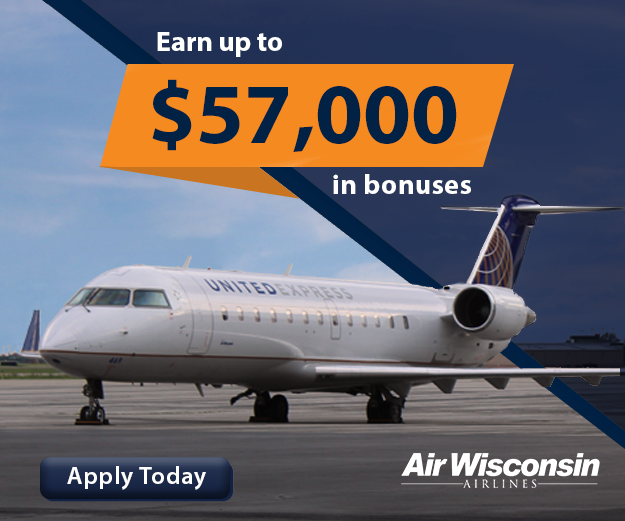 Like other flow programs, no additional interview is required, which means that a pilot’s interview with Trans States could be the last one of their career. Swedberg praises the Trans States instructors in particular for providing the guidance and direction that allowed her to become the pilot she is today. Trans States Director of Flight Operations Lee Stelzner cites the similarities in both companies’ cultures, as well as the strength of the Trans States training program, as contributing to the ease in which Trans States pilots have transitioned to the Frontier flight deck. 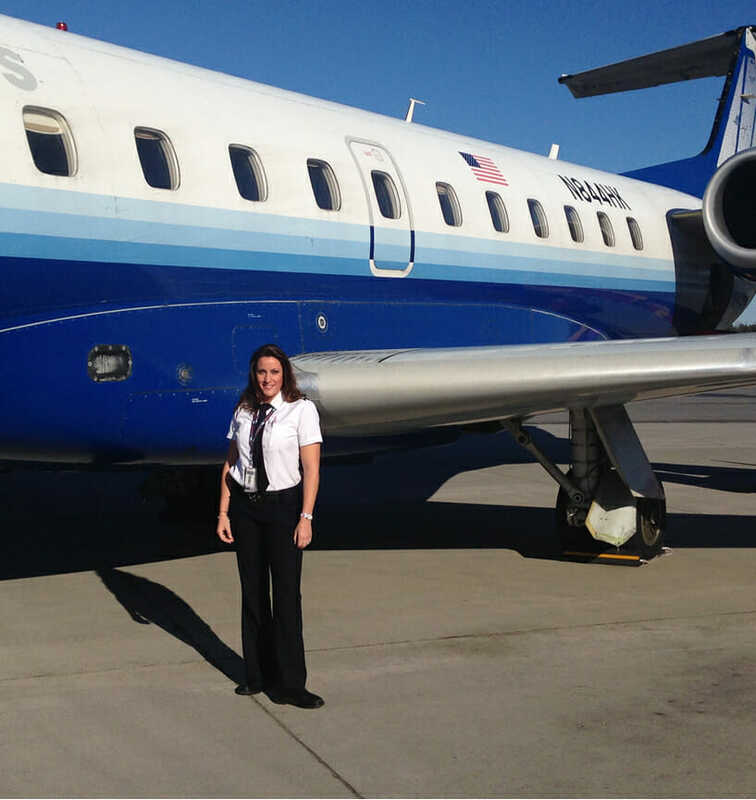 “Trans States Airlines is a great place to build the experience you need to meet the Frontier hiring requirements,” Stelzner said. “With our outstanding training footprint, pilots are very well-prepared to enter Frontier’s training environment and succeed. Trans States Captains Benjamin Church and Jeffrey Martin were two of the first Trans States pilots to opt-in to the flow program. Both appreciated the ease of transitioning to Frontier looked forward to flying Frontier’s fleet of Airbus 319, 320 and 321s. Captain Martin echoed those sentiments, remarking that he looked forward to seamlessly advancing his career, as well as the opportunity to fly the Airbus. 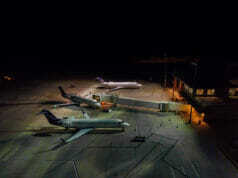 For many pilots, an airline’s potential for growth is a key deciding factor when considering where to build a career. That’s because obtaining additional aircraft mean faster Captain upgrades. Frontier pilots have a lot of growth to look forward to, given that Frontier has announced its intent to triple the airline’s fleet size over the next 10 years, growing the airline’s order book by 200 aircraft. Additionally, Trans States’ route map is shifting west, and its growing Denver crew base has been very popular with its pilot group. 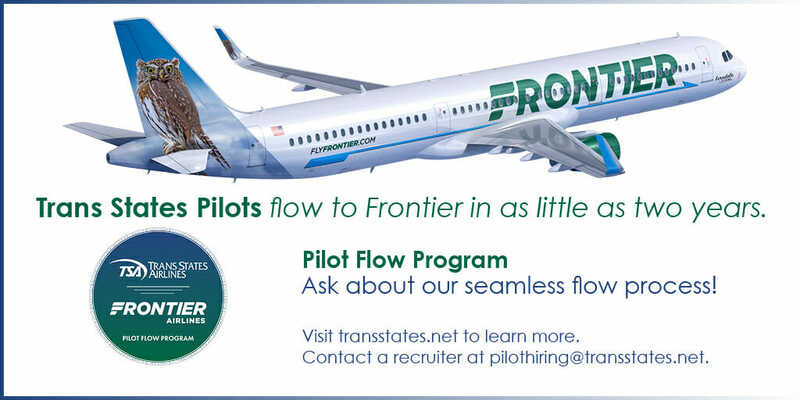 Given the base’s popularity and Frontier’s significant presence in Denver, it’s of no surprise that the flow program has proven attractive to the Trans States pilot group. Unsurprisingly, the Frontier team made him feel right at home. For more information about the Trans States and Frontier flow program, please visit transstates.net or email pilothiring@transstates.net. 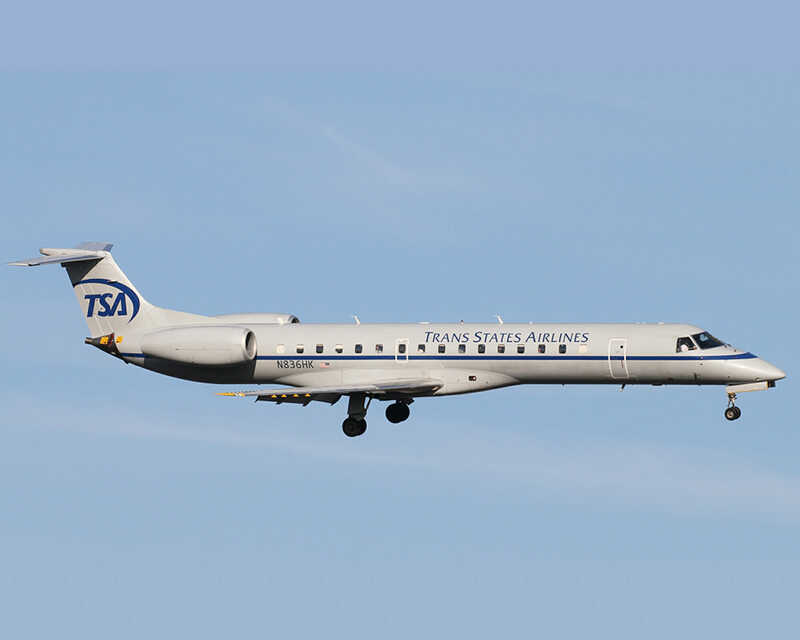 When Trans States Airlines began as Resort Air in 1982, it operated just a handful of Metro II aircraft and carried just under 7,000 passengers during its first year of operation—tourists, primarily, between its headquarters in St. Louis and a popular lake two hours south of the city (hence the call sign "Waterski," which Trans States still uses to this day). However, things have changed a great deal since 1982. Since that time, Resort Air has evolved from a small boutique carrier into Trans States Airlines, a carrier that served nearly 3 million passengers in 2015. 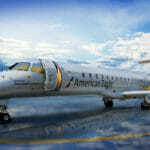 The Metro IIs have been replaced by an all-jet fleet of Embraer 145s, and Trans States now flies on behalf of United Airlines (as United Express) and American Airlines (as American Eagle), providing service to over 70 cities in North America with approximately 237 daily flights. At Trans States, our mission is simple: To remain flexible and responsive to the needs and challenges of our major partners and the aviation industry , while striving to do our best for our customers. We are committed to providing safe, reliable and on-time air transportation and to delivering the highest standards in professionalism and customer service. We’d love the opportunity to demonstrate this commitment to you in person. 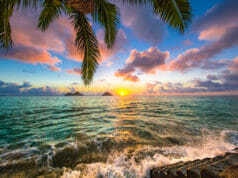 Our over 900 employees look forward to welcoming you onboard!